My quarterly magazine break arived yesterday and I enjoyed reading it as I always do. Full of inspiring artists stories, how to apply for council awards, book reviews, meetings forthcoming and past. I enjoy reading these quarterly magazines as they keep me focused and determined to succeed. I applied and was accepted to exhibit my work in the Vessel Exhibition at the Vessel Gallery in London for a fundraising event organised by the Contemporary Glass Society. I was especially pleased to see my Vessel in the Portfolio section after the VESSELS @ VESSEL review by Katherine Coleman. Her review is brief and to the point. Listing the visitors favorite 'Old Bean Can' by Rachel Mary Elliott. I can see why. The skills and talent involved in making this glass tin can with a few glass beans in is fabulous and fun. All this feedback and articles I read, in this magazine and others alike, whether it be about my work or not it all helps my understanding of what is liked and more importantly appreciated. It shows I'm on the right path as my image of my work was selected to be printed. I am pleased to see my work alongside these fabulous glass artists and I will continue to support the CGS when ever I can do. With special thanks to Pam Reekie at the Contemporary Glass Society for keeping all the artists informed and up to date. Contemporary Glass Society (GCS) have organised an exhibition for members to sell there glass in order to raise much needed funds for the society. CGS is delighted to announce our open show at Vessel Gallery London. Vessels have been with us for thousands of years and are part of our everyday use. CGS has challenged its members to create an exciting variation of an everyday object, to use their imagination and produce a fantastic vessel. The only restriction is, its volume should not be more than 750ml. 136 CGS members have said they will take part in this amazing show, including artists Angela Thwaites, Katharine Coleman, Rachel Elliott, Stewart Hearn Debbie Timperley, & David Reekie. This is a fund raising show for CGS and all money raised will go toward future events. 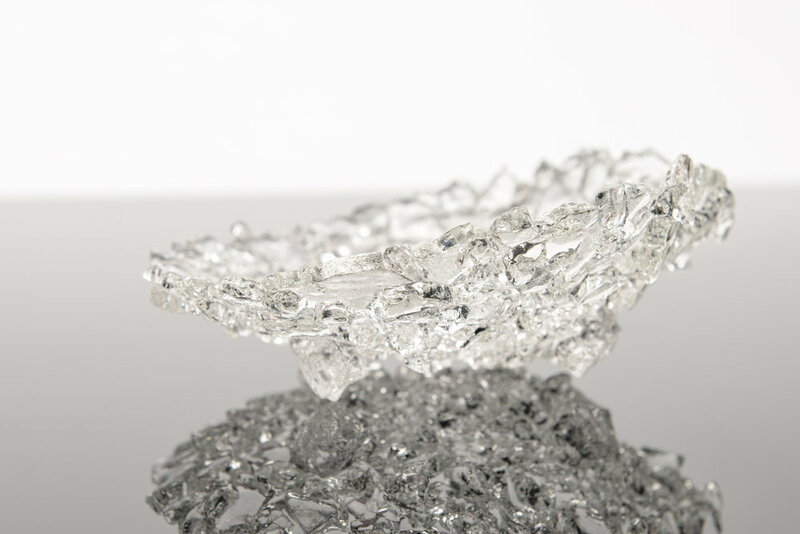 Founded in Notting Hill, London in 1999 Vessel Gallery aims to be a major destination for all those who appreciate contemporary art-glass sculpture and decorative lighting. From the stunning simplicity of Scandinavian crystal, via flamboyant Italian art glass, to the best of British and International creative talents." Pictured above is Gradients (ii), the piece, I have donated to this fundraising show. "Following on from the successful annual student glass prize awarded at ‘New Designers’, C.G.S. has decided to expand the opportunity for all British and Irish glass graduates. We have replaced the New Designers Glass Award with a more inclusive publication, “C.G.S. Graduate Review”. This is a 16 page publication, which will be circulated extensively as well as via Neues Glas - New Glass: Art & Architecture, crafts&design and CRAFTS social media and will give us an opportunity to showcase more of the emerging talent form British Graduates. There will be prizes for the Winner and two Runners-up."